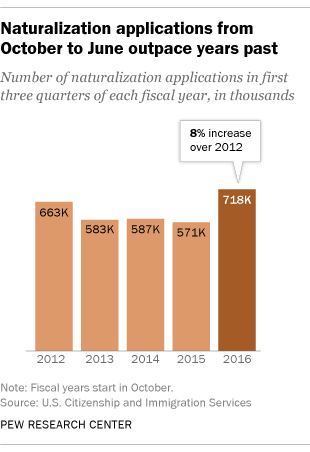 The number of legal permanent residents applying for U.S. citizenship in the nine months starting last October is at its highest level in four years, and it is up 8% from the same period before the 2012 elections. 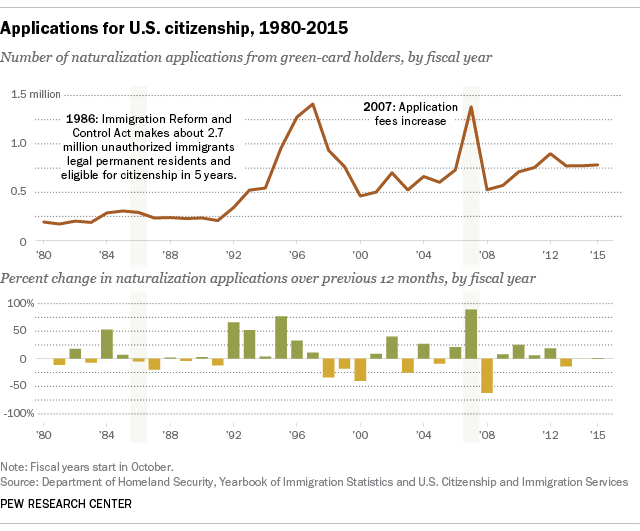 Although some organizers of naturalization and voter registration drives have suggested the increase is a reaction to Donald Trump’s candidacy, a Pew Research Center analysis of naturalization data shows there have been much larger percentage increases in past years, with jumps not always coming during election years. But application numbers don’t always increase during presidential election years. In fact, many past spikes have occurred for more practical reasons, such as a pending fee increase. This is an updated version of a post originally published on May 13, 2016.